‘MVIC – The Interview’ Now On YouTube! In the midst of several projects, Trippy Tran Films produced a team for a 48 Hr Film Project while wrapping the final year of production on their debut feature “Obliquity: Imagery of the Unknown” (See Movies), while working on music under the pseudonym, Trippy T (See Trippy T Music) and this being all after making the touching drama “His Name Is Walter”. Needless to say, 2012 was a very busy year for Tran and team who then debuted his first music video ‘2012/Shimmer of Longing’. 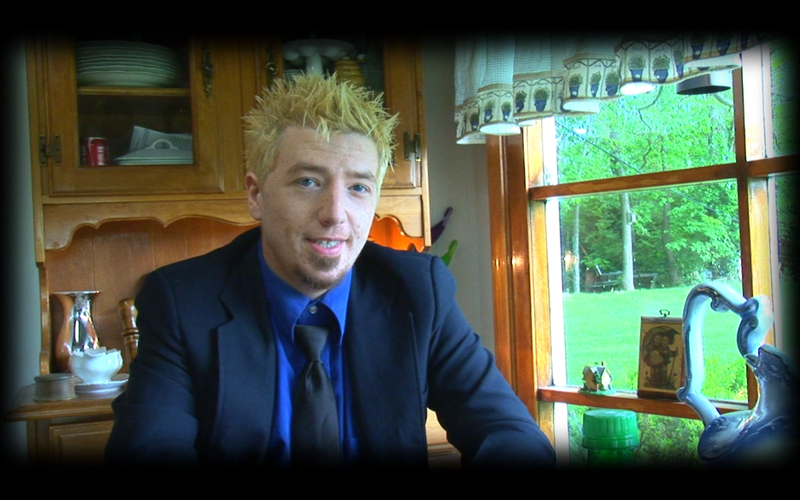 While filming several interviews for ‘Obliquity’, Anthony wanted to do an interview about their promotional city adventure in the film “My Vacation In Cincinnati” and now, the interview is officially released after 3 months of editing solo. See the docu-interview below. 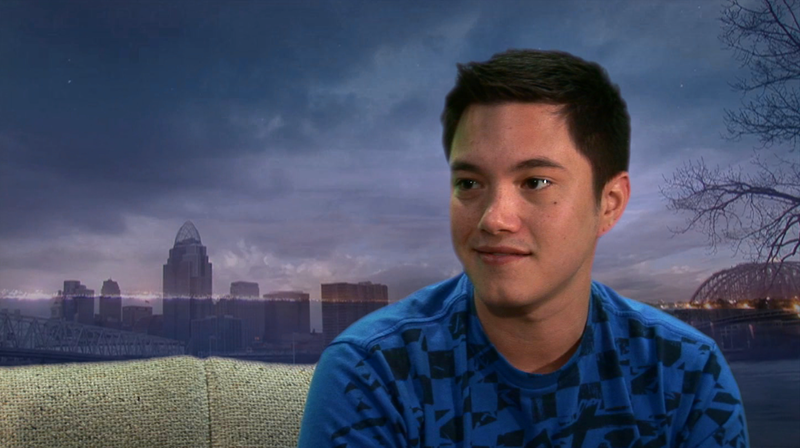 This official interview features cast members Chris Corman and Amanda Eichelberger with director/producer Anthony T. Tran discussing the creation of the 48 Hour Film Project in Cincinnati by utilizing the Vacation genre and the many collaborative efforts in making a movie. This special interview is for the upcoming DVD release and will be available on the Trippy Tran Films Short Movie Collection 2008-2013 – coming soon 2015. Chris Corman (Obliquity: Imagery of the Unknown) reveals playing a different role and making the film. Filmed in 2012, Trippy Tran Films entered the 48 Hour Project in the Cincinnati competition during the midst of wrapping production on Obliquity: Imagery of the Unknown (which also stars Chris Corman) making My Vacation In Cincinnati one of Cincinnati, Ohio’s biggest promotional project yet: a movie highlighting some of the city’s diverse attractions with a dramedy twist. Featuring music, art, and locale of Cincinnati as the main focus of a film, MVIC is the 6th produced TTF short. Director/Producer Anthony T. Tran (founder of Trippy Tran Films) reveals filming MVIC. When a couple wins tickets to a rock show, they get an all expense paid to Cincinnati, Ohio but what is this city really about? The Cincinnati Reds? The Ohio River? The Thompson House? The Purple People Bridge? Or is it a bowling alley such as Eastgate Lanes? Or perhaps a bed and breakfast at Stonehouse? 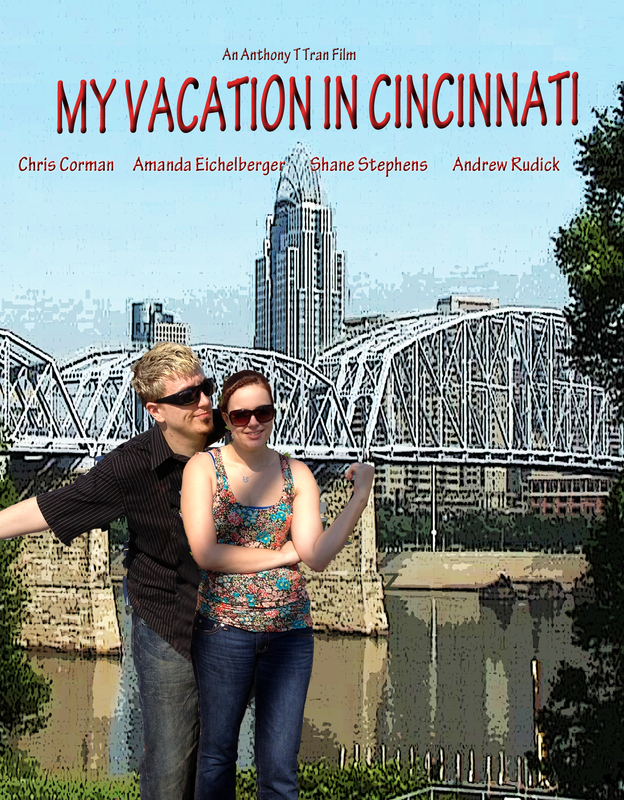 As Troy (Chris Corman) and Gina (Amanda Eichelberger) travel around Cincinnati’s diverse locations, what will the real prize be? 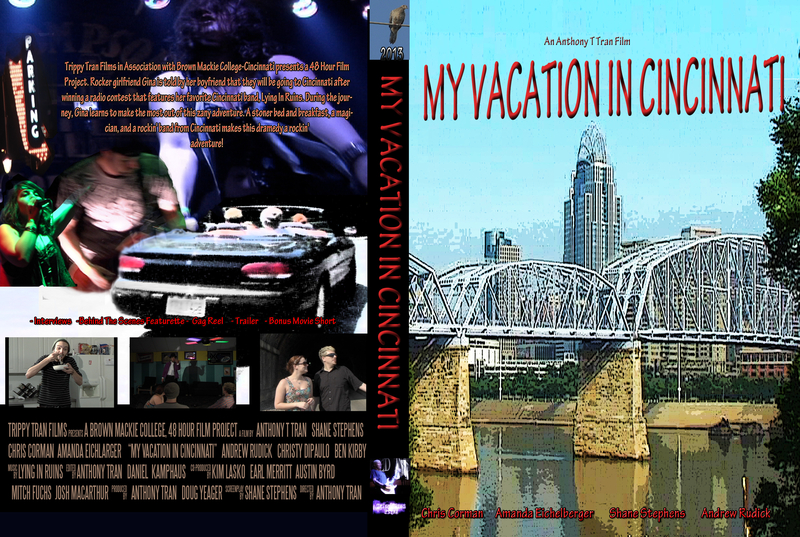 Find out in My Vacation In Cincinnati – The Interview (A Trippy Tran Films DVD Bonus Feature coming soon 2015) and be sure to share the story of film making, Cincinnati, collaborations and music by sharing this article and video. Have you been to Cincinnati? Enjoyed ‘My Vacation In Cincinnati – The Interview’? See 2008’s ‘Duality – The Interview’ below. Duality – The Interview features Trippy Tran Films first 3 short films (iNpersonNation, UI: Universal Intelligence, Duality) focusing on the production aspects of Duality. My Vacation In Cincinnati – The Interview is the second released official interview with Trippy Tran Films and touches on all 8 films (7 shorts, 1 feature) focusing on the production aspects of My Vacation In Cincinnati and highlighting the city, the community, collaborations and more. Obliquity: Imagery of the Unknown will feature several interviews upon release.